I spotted these in Asda, and rearranged the shelves to compare the sizes - ready for another instalment of Disappointment Wars. Then I mentioned them to someone at work who had spent time working for Asda who said "oh, those are great - I ate loads of them!". But the time I'd got home my partner had opened them and also decreed them to be pretty good. So - Asda Snax are basically a slightly smaller tub of Pringles. And essentially half the price. They also come with poetry - which I fully expected to have at the bottom "by Angela aged 8 3/4"
And they look the right shape too - maybe a bit less twisty somehow (maybe that's copyrighted). 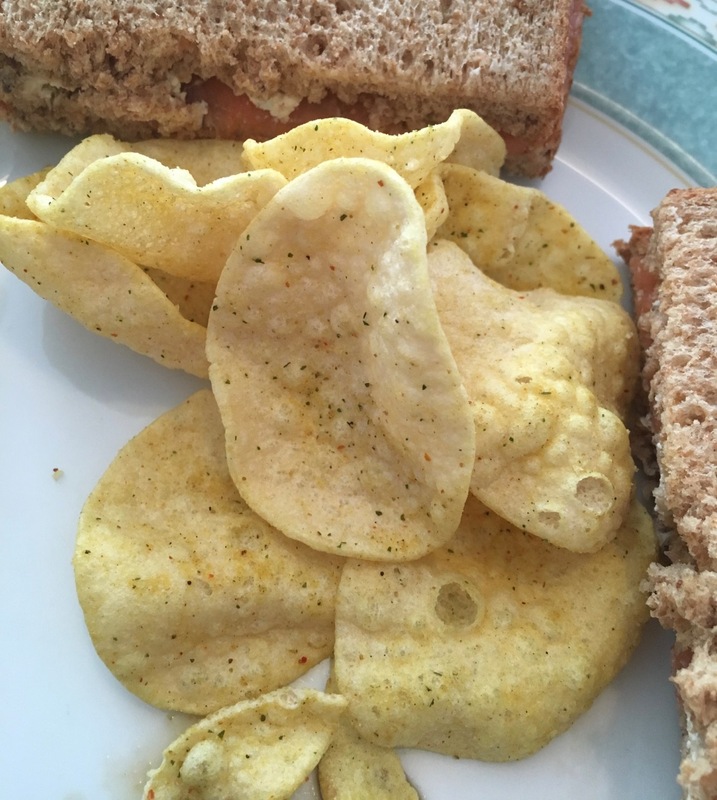 And while they aren't as compulsive as Pringles are (I don't think any food on the planet treads the line between 'compulsive' and 'addictive' as Pringles do) they are very enjoyable, and reasonably filling. They do taste more like a traditional Salt & Vinegar crisp too, so probably won't fool anyone at the buffet. But if you are looking to buy a Pringle shaped snack on the occasion that the real deal isn't on special offer - try these, you'll probably like them. The box of this Night Time blend recommended leaving the teabag in freshly boiled water for around fifteen minutes. This isn't a problem for me, as I prefer strong teas and generally leave my teabag in for ages. There was an instance where I'd forgotten to take the teabag out and was in a meeting with a senior manager. He did find it funny when I ended up wearing the teabag and no small amount of tea on my white shirt when attempting to finish the mug. On making this Night Time blend the first mistake I made was to sniff the teabag. As I blogger I find that I do these things; sniffing products I wouldn't usually sniff and describing the smell to others who may never sniff it either. However I do remember sniffing varying teabags when I was younger and tried different blends during a tea discovery phase. This Pukka Night Time smelt mostly of lavender with a combination of flowers and herbs behind it. I then made the second mistake of smelling the freshly brewed tea before taking a sip. It smelt mostly of lavender, with a combination of flowers and herbs behind it. I'm sure this would be good in a steaming hot bubble bath, but not so good if you're just about to drink it. I then made the third mistake of trying to drink it. Taking a tentative sip I found this Night Time drink tasted mostly of lavender, with a combination of flowers and herbs behind it. 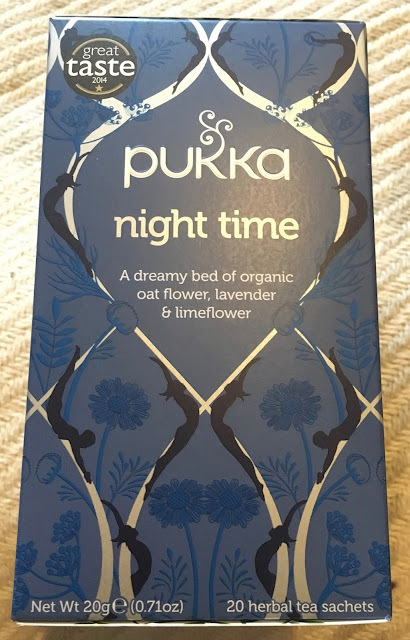 This is fine if you've had your head under the water in a steaming hot bubble bath and swallowed a little, not so good if you've got a full mug of it and nineteen other teabags staring at you from a particularly fetchingly designed vegetable ink printed box. Did I find this Night Time blend relaxing? Not in in the slightest. Did it leave a weird taste in my mouth afterwards? Absolutely! Having said that it did mostly wipe away the nasty 'hangover' of onion and curry taste in my mouth from the meal out the night before, although it did leave me looking for something to get rid of the lavender taste afterwards! The 20g box has 20 herbal tea sachets. The ingredients were 100% organically grown and were made up of; oat flower tops (20%), licorice root, chamomile flower, lavender (14%), limeflower (10%), valerian root, and green Rama tulsi leaf. So yesterdays shopping trip included the purchase of this rather impressively huge Coconut Toblerone. “That will be a fun parcel to wrap” said the cashier as I paid, I politely agreed as I was a little to embarrassed to say I’d purchased it for myself to eat, and was not even going to wait until Christmas. I wouldn’t have bought such a big bar if there had been a smaller version, but this was the only size that the new Coconut variety Toblerone was available in. They forced my hand. I opened up the cardboard wrapper and pulled back the foil. 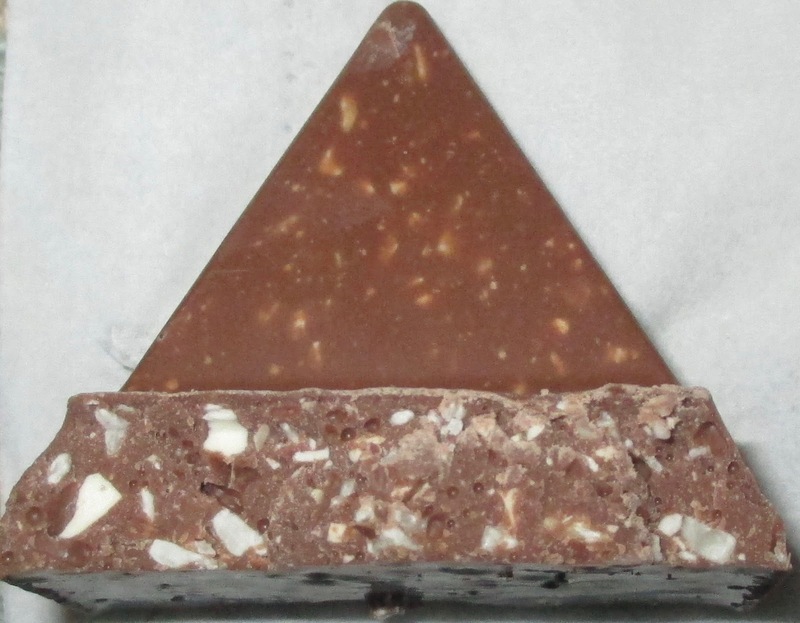 There has been a lot of controversy over the spacing of Toblerone pieces and cut backs. It was difficult to judge as to whether or not this bar had been affected as the pieces were large enough that I could easily fit my thumbs in to break parts off. 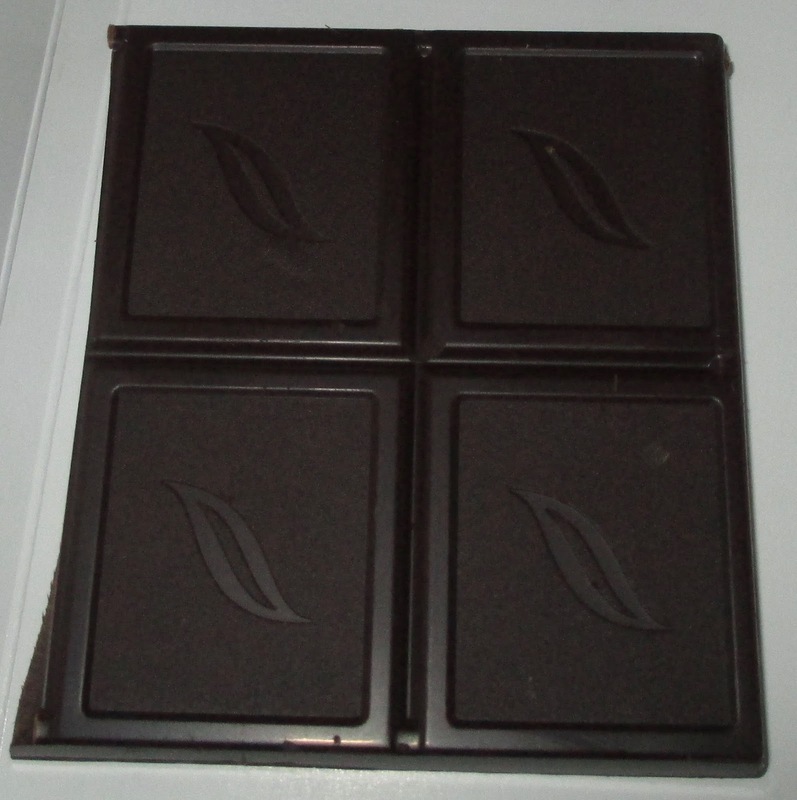 I think the distance between the pieces looked ok for a scaled up bar. Now this new Toblerone is referred to as Crispy Coconut, but I’ll be honest the texture of the Toblerone is such that the coconut is rather mixed in. Between the nuts and sticky nougat there was a slight crispiness to the texture mixed in, a vague light crunchy feel when you bite in. The difference in texture though it something you have to look for, not something I would say defines this bar. On the flavour on the other hand, the coconut very much holds its place. The creamy coconut taste is a good match for the chocolate and the nougat and works impressively well. 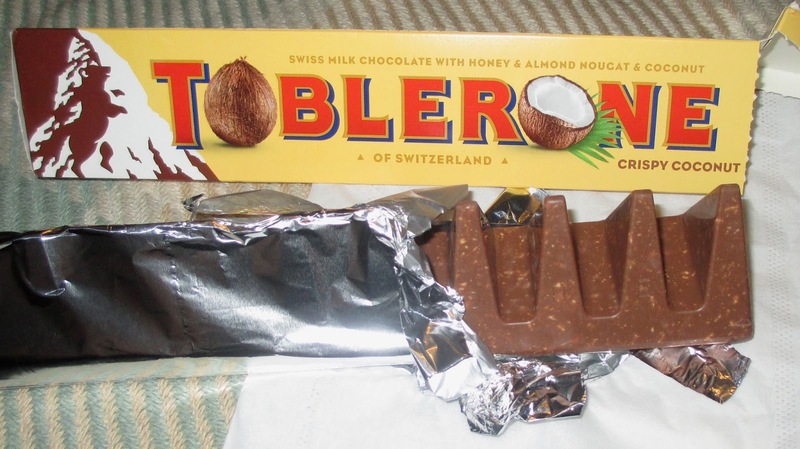 This is still Toblerone, with its usual honey nougat and nutty taste, but the distinct taste of coconut shines on through and is a most welcome addition. The bar is big though, and it is going to take me a while to munch through, but rest assured I’ll give it my best shot. Gosh it is cold out today. I was trying to take a look at the Monday post Black Friday sale remnants. So err Cyber Monday but actually in store if you see what I mean, this sale lark is confusing! 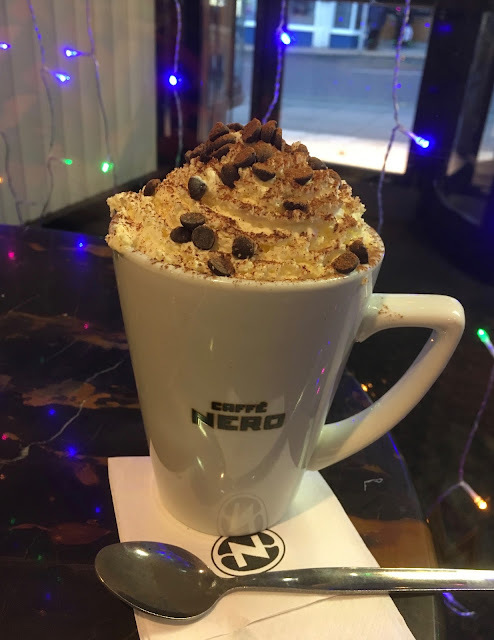 Anyway having not found very much to buy I decided to have a warming hot chocolate in Cafe Nero and spotted that they have a special of a new Clementine Hot Chocolate. I can’t resist a seasonal special so no surprises o what I ordered. The drink came topped with whipped cream, chocolate drops and cinnamon. This is where I started, trying to make the hot chocolate safe to drink without getting cream up my nose. :-D I enjoyed scooping the cream concoction with a spoon though. The cinnamon sprinkles were good prep for the seasonal hot chocolate. I was impressed by the clementine flavour within the hot chocolate, it was very much softer than regular orange and I liked the more delicate notes in the taste. It was gentle and a not too sweet citrus twist. It blended well with the milk chocolate flavour, making this a soothing sweet treat. It warmed me up perfectly and was the energy I needed to fuel me for a bit more Christmas shopping. We all love a bargain, so when I was pointed towards these reduced (£1 off!) tea-bags in a handy resealable bag I couldn't resist. Sure the pyramids will get a little squished but it keeps them nicely fresh for work. It has the usual nonsense on the back, plus good tips for not over-brewing it, and advising people not to add milk. The tea-bag is a lot harder to convince a phone to focus on, it's like a little pendulum. The leaves are a little smaller than I'd expected, but then green is just the tips. They expanded out nicely once heated and all the apple bits floated pleasingly to the top of the bag. They thought this through! The smells on opening the bag were pretty strong, and the tea kept the flavour too (which is always a worry with fruit teas). The green wasn't too harsh - a very anglicised blend - and the apple was the dominant flavour with the elderflower as a hit at the end. Fabulous cup of tea, that is a bit more of an elevenses tea than I was expecting, which is great because i don't really have a 'green' for that time of day (I tend to default to PG decaf, which I know is essentially a mostly green blend). I do enjoy the odd flavoured beer. It's true that some are odder than others, and some fruit flavoured beers can be downright unpleasant, such as banana beer and passion fruit beer. I've tasted blood orange beer before and liked it, as well as orange peel beer (which I haven't seen for a good while) and loved it. I remember that they go especially well with fishy dishes. 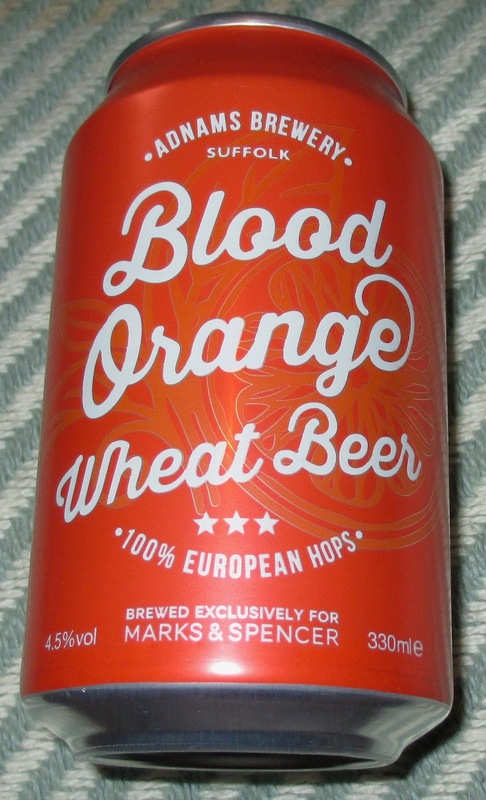 You've probably guessed it from the title, blood orange juice was added in the brewing of this 4.5% volume wheat beer by Adnams Brewery in Suffolk. Although not named on the can 100% European hops were used in the brewing as well as malted barley and malted wheat. On opening the can there was an orange smell mixed in with the wheat and herbal hops. I expected more of a citrus smell, and figured my nose was a little broken from the steam room at the swimming pool earlier. There was indeed an orange tint to the golden beer as I poured it. On taste there was an unexpected sourness. Unlike all of Adnam's usual perfectly lips-smacking craft ales, the first taste of this beer actually made me worry slightly. Worry enough to check the date on the bottom of the can. I'm not sure the herbal hops mixed well with the blood orange juice. I'd have thought more citrus hops would have been used, either that or the malted wheat in the background just didn't get on with the blood orange or the hops. This beer seemed to me like an argument of flavours that left a fairly unpleasant taste in my mouth. A new branch of Debenhams opened in Wolverhampton, which is quite exciting for the city. Obviously I went for a bit of am explore, and having looked round the clothes and make-up I discovered the gift section, and within that of course there was the confectionary. Oh my, I could practically build my entire Christmas list from the choice there. 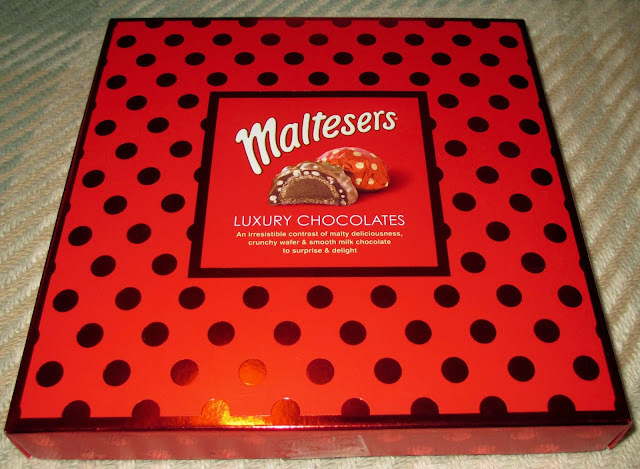 I did however decide to treat myself to these new Maltesers Luxury Chocolates, for blogging research purposes of course. 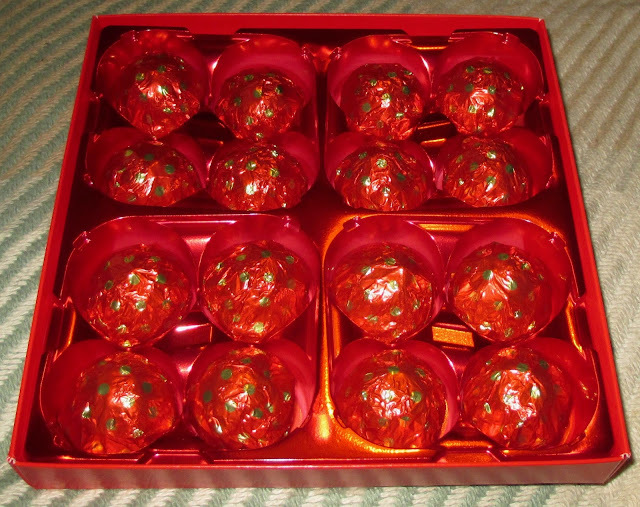 Although Maltesers are synonymous with Christmas gifts, they are usually in their normal form of a malt flavours crunchy ball coated in milk chocolate. This year Maltesers have introduced these new Maltesers Luxury Chocolates and just for fun individually wrapped them too! Don’t worry though they are actually quite big chocolates inside the box, there are 16 of them individually wrapped. The box is epically bright inside too, it is very red! 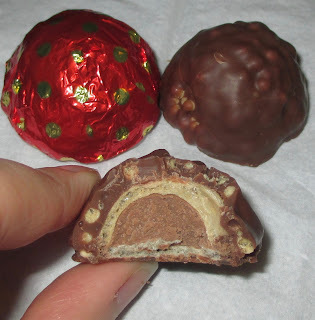 Each one consists of milk chocolate, malt and wafer and tastes rather good. I didn’t think that the chocolate was quite the same flavour as that in regular Maltesers, although it was still sweet and milky. The flavour of the malt was a little subdued but the mix of textures made these. 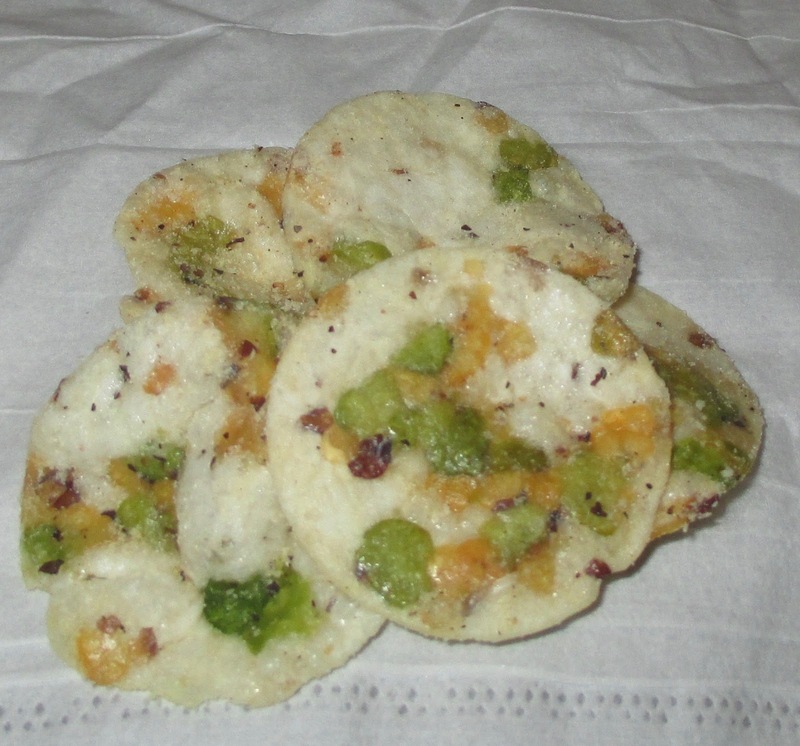 They were soft and crunchy in different places and nice to munch on. I liked the fact they took two bites and they were a bit of fun. The only improvement for me would be a touch more malt in the taste, after all they are called Maltesers so it aught to be the dominant flavour. Birmingham town centre has lots of promotional give-aways and odd Free food sometimes, some more tenuous than others. Here we have the prime example of some free biscuits - to advertise the butter that they used to make them. And they are pretty decent biscuits too, with spices and mince meat in them to taste all Christmassy. Apparently there was a giant tree too as part of the stall but I failed to notice that. I’m not sure that this will make me more likely to choose Lurpack when baking the Christmas treats, but all this festive good cheer can’t hurt can it! 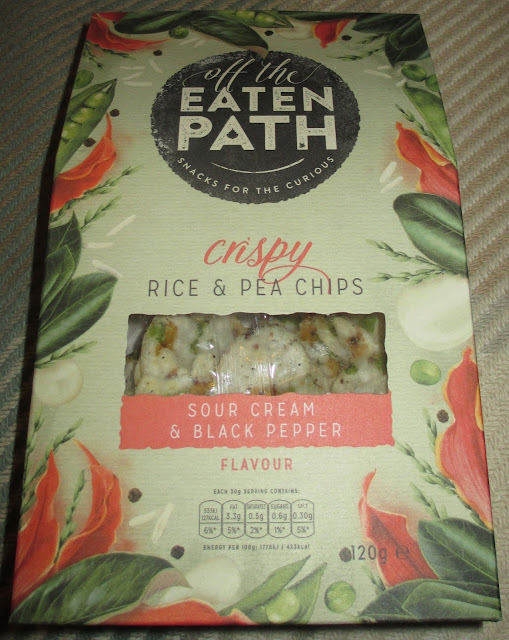 Always on the lookout for alternative snacks to crisps and nuts I found these Off The Eaten Path Crispy Rice and Pea Chips in the local supermarket, which are Sour Cream and Black Pepper Flavour. It did make me smile when I read the back of the packet, as it stated "Surprisingly tasty snacks made with real vegetables." 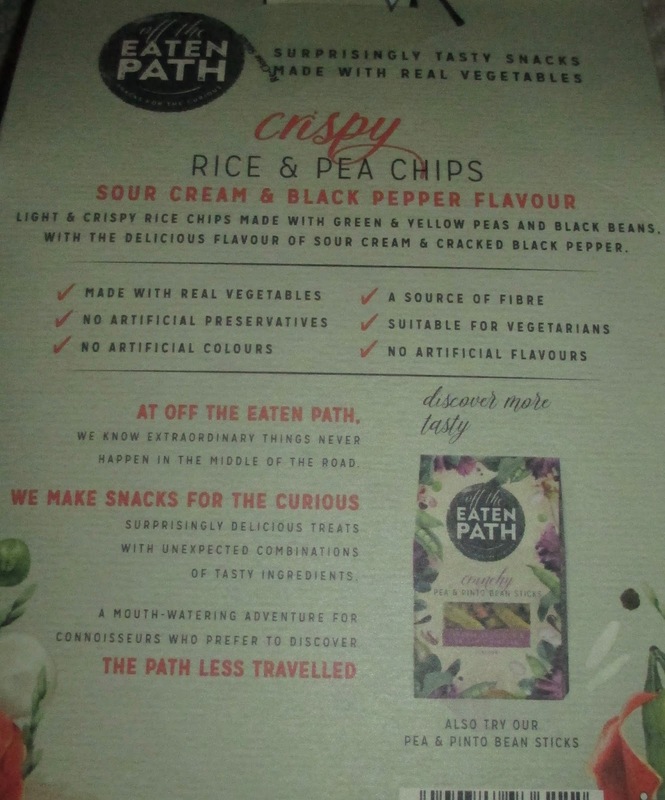 This amused me firstly because the manufacturer was surprised that they had created something "surprisingly tasty", and secondly that these rice chips are made with "real vegetables", as opposed to the fake ones you get on tables in department stores, I suppose?! Anyway, these rice chips are made with green and yellow peas with a sprinkling of cracked black pepper. On opening the packet I could at first see that they were pretty funny looking rounded crisps (see photograph). Not particularly appetising looking I must say. Perhaps that's where the manufacturer's surprise came from when they dared to bite into their first rice chip? In texture these rice chips are very crunchy. Not too tough on the teeth, but they wake you up when you eat one. Eating two at a time would be a bit ambitious. There's a taste of rice first which quickly mixes with the cracked black pepper. There follows a pleasant two stroke pea flavour, which merges back into cracked black pepper and rice into the aftertaste. Considering how oddly ugly looking these rice chips are, I did rather like them. I found them quite moreish in a weird kind of way. 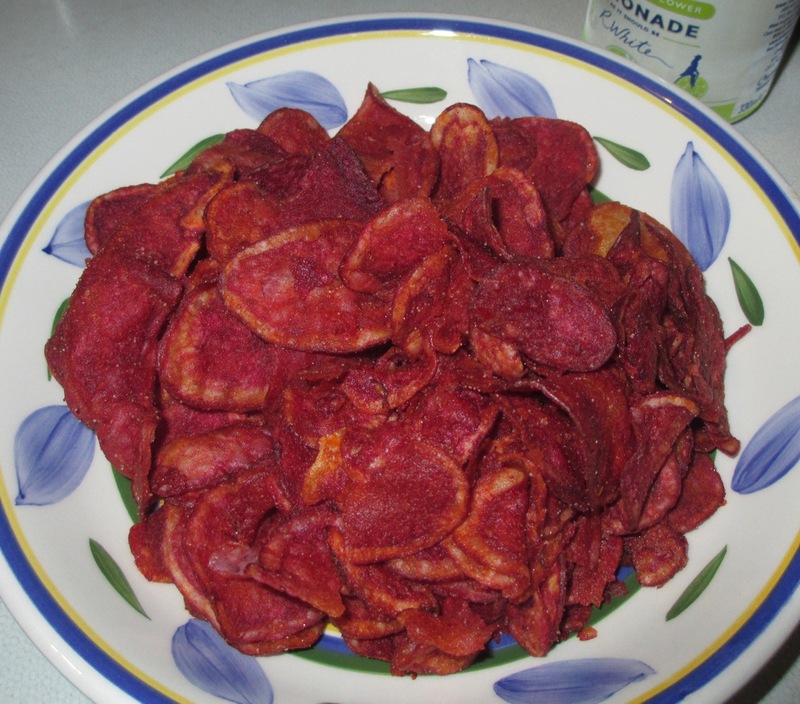 Besides, black pepper flavoured snacks generally go down a treat with me. They usually go well with a beer, you see… There are also Pea & Pinto Bean Snacks available, and I wonder if they're funny looking to? The 120g packet has 127 calories per 30g serving, with 11g of fat, o.6g of sugar, and 0.3g of salt. No artificial colours, flavours, or preservatives. Suitable for Vegetarians. Please see photograph for the ingredients. You can’t say we don’t get a good variety of crisp flavours in the UK. I often find flavours even now that wow me and are just varieties I haven’t tried before. Walkers are excellent for this and yet again they have surprised me. Japanese Sweet Wasabi and Ginger sounded like a very intriguing combination. Now I have a love hate relationship with Wasabi, I think it burns my nose and I can barely tolerate the hot stuff, but I still love it. This gives the slightly odd look of me with watering eyes if I eat it in a restaurant but despite the tears, I am thoroughly enjoying it. I don’t have the same relationship with chilli, I’d much rather just have a medium heat with that. Wasabi though, hot is more. For those who don’t know what it is the nearest equivalent is a hot Japanese version of Horseradish sauce. Place a generous dollop on sushi and allow steam in the nose to form. Anyway onto these crisps, we sat down to share these with lunch and my mum said she’d taste one before having any on her plate. She said it was too hot, and choose not to have any. This interested me and I was looking forward to some Wasabi heat. I took some for my plate and ate one. 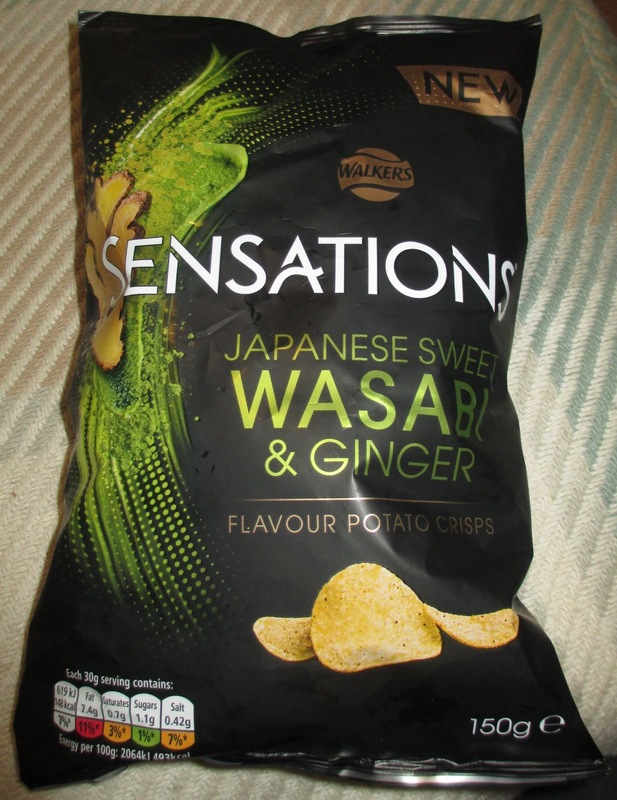 It was lightly flavoured, a vague hint of Wasabi and a subtle touch of ginger. If I had to be honest it was shockingly plain. Now my mum has decent tolerances of heat so I was confused by this reaction. It was hot she claimed again. I munched my way through a few more, then I hit one, one that was tangy and spicy and bursting with Wasabi goodness and flame. Now I know what my mum had meant. 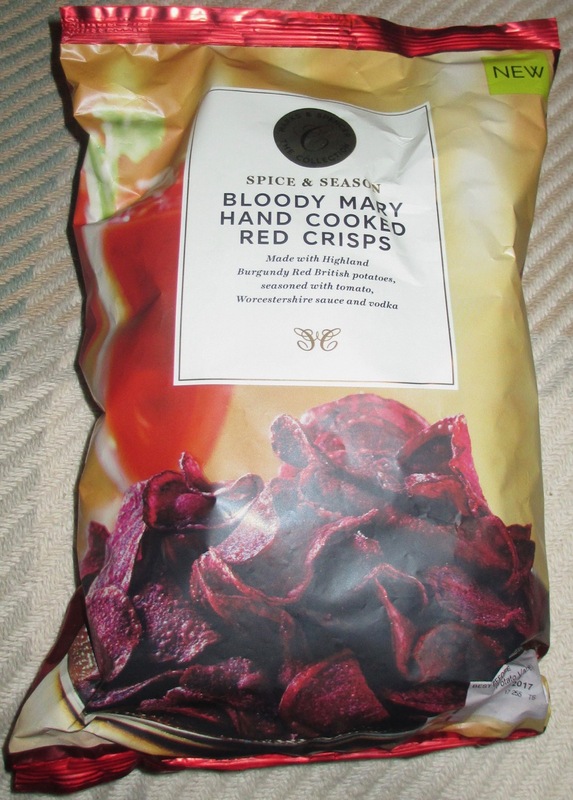 The seasoning was completely unevenly split, and this meant that in my portion there were a few super spicy heavenly crisps and the others when compared directly to them were as dull as anything. 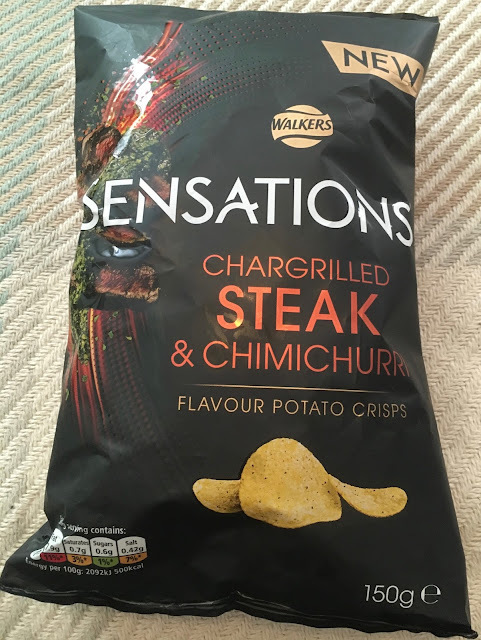 This is very unusual for Walkers, so I may have to treat myself to another bag and hope this one was just a bit unlucky with the seasoning. Tiz the season to be jolly, and the season for the Christmas sandwiches to hit the shops. 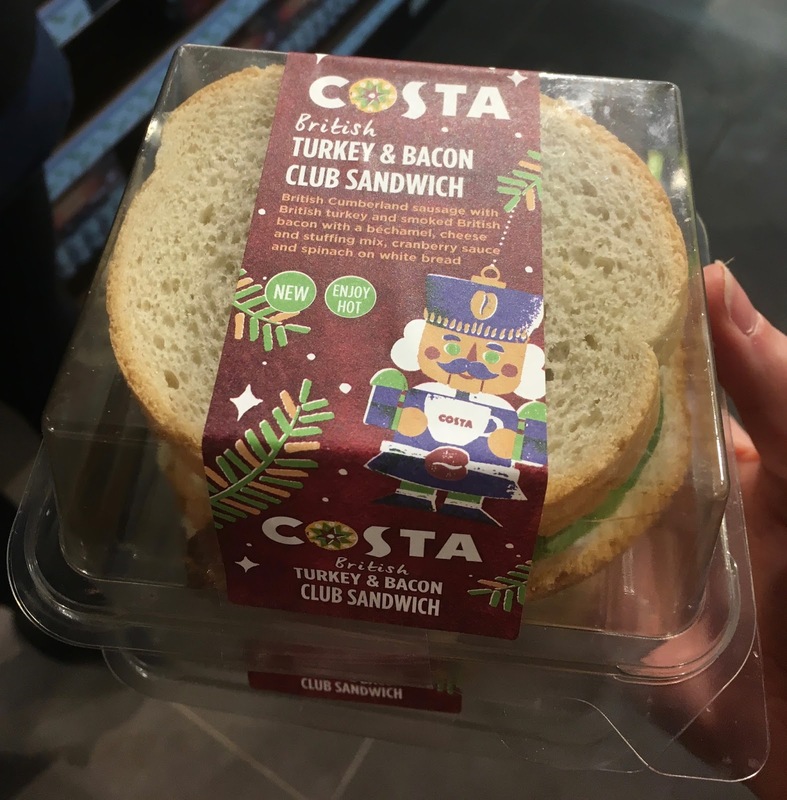 This year I thought I’d start off by trying out the new Club sandwich from Costa. 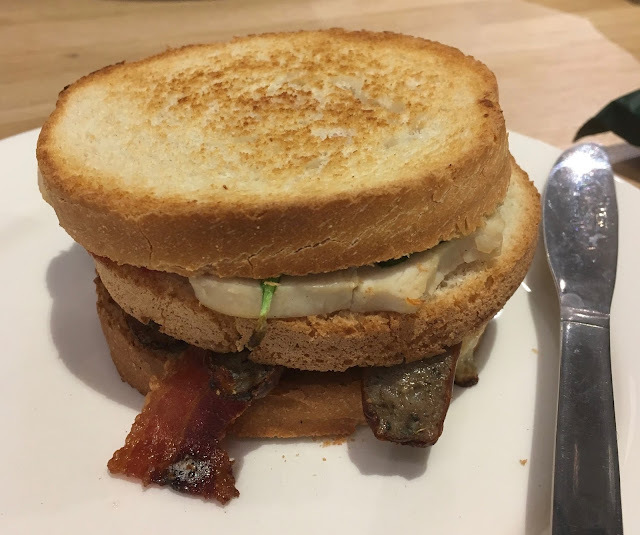 As a club sandwich there are three slices of bread and two layers of filling, the first one being sausage and bacon, the top layer being turkey, stuffing and spinach. Not sure where the spinach fits in on the usual Christmas dinner, but I was pleased to see some green in there and I would have been more wary if it turned out to be Brussel Sprouts! Thankfully the bread on this sandwich was smaller than regular bread, which meant that the tower of sandwich before me was more manageable. The sandwich was toasted by Costa, and this gave the bread a lovely texture. This was still a very indulgent sandwich and a meat lovers dream. There was turkey, bacon and sausage all making themselves known, and it had a very substantial feel. I loved the meaty taste, and it was filled with the flavours of Christmas. There was a lovely aftertaste of stuffing and cranberry and both added a good hit of herbs and sweetness. 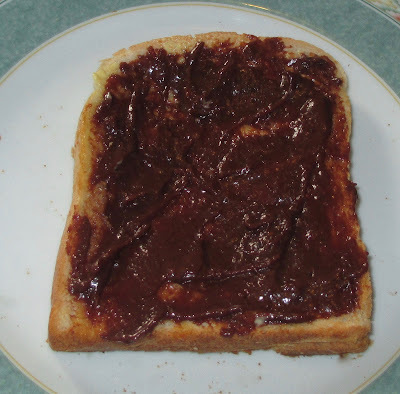 As someone who loves a mix of textures I felt the toast and all the ingredients made this very enjoyable to eat. This is my first Christmas sandwich of 2017 and it is going to be hard to beat! As it gets colder and the shops cotton on to the fact that some people want Christmas to start at Midnight on Halloween we see the festive variations creep onto the shelves. Gregg's started their viral advertising early and hard this year by putting a sausage roll into the nativity instead of aliens and otters like my family's ever expanding Playmobil version contains. I assume this was to announce the following - we do a Christmas Toastie - and a Festive Bake now! I'm sure they have done these previously, and I may have even reviewed the bake, but I don't remember the toastie and it's quite a cool proposition. A hot turkey and bacon sandwich doesn't need festive branding to get me interested. This is £3. The Festive Bake is half the price - but it's just chicken and bacon which isn't quite as festive. Also the chunks are smaller and less recognisable. As you can see the sandwich is quite stuffed - with big quality chunks of meat and actual recognisable ingredients and flavours. They have decided that it needed cheese on top - because toasties can't exist without it?! This kind of ruins the festive flavour a bit, but luckily the rest is good enough to overpower it. Well worth it if you like all the ingredients and want a hot sandwich. I had the Festive slice for pudding (unremarkable compared to the sandwich, but certainly edible). And an egg custard for starter because the sandwich takes a little while to toast. I've drank a few gluten free beers before. They are generally made with corn maize, or other cereals, instead of malted barley, which do not trigger an autoimmune response in celiacs, although some brewers limit the amount of malted barley by using rye. Although tasting slightly different than full-on gluten beer, the gluten free beers I've tasted in the past have always been pleasant, but usually missing something (of course). Having said that I am rather partial to red rye beer with its spicy flavour. This Green's Gluten Free Pilsner was produced in Belgium. At 4.5% volume this beer sports a hoppy and citrus aroma on the label with a hint of vanilla. Unlike many gluten free beers, this beer was made with malted barley, but with the gluten removed. On opening the 330ml bottle I was certainly greeted with a hoppy smell with undertones of citrus and a slight sweetness at the back of the smell. This joyously fizzy golden pilsner filled my waiting beer glass with welcome bubbles and a cheeky white head. On taste bitter citrus hops bashed at my tastebuds first, closely followed by the malted barley and a hint of the bottom fermented yeast that makes it a lager, and differs it from top fermented yeast for making ales. This is a very tasty lager, not too bloatingly fizzy like some lagers can be. Its obviously taken a great deal of care and attention to make it, rather than some other mass produced big burping lagers that 'grace' the shelves of so many supermarkets. This is great stuff, I'd recommend it, and it certainly didn't taste like it was missing anything! 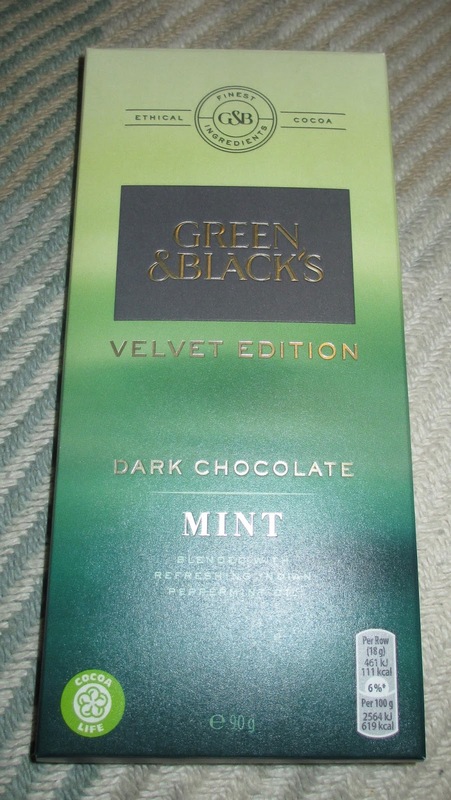 This is a new bar of chocolate from Green and Black in their new Velvet Edition range. I am a big fan of mint chocolate so I thought this might be right up my street. The bar itself is neatly packaged in card and then foil wrapped. The pieces of chocolate are very dark in colour and the aroma from the bar is outstanding, the tones of peppermint where very appetising. I broke a piece of the chocolate off and was surprised by how firm the snap was. I do expect a firm snap on chocolate of good quality, but as this is a “velvet edition” bar I had thought it might be softer. The flavour is a wonder mix of rather strong dark chocolate tones, wrapping themselves around a fragrant and powerful peppermint. The chocolate isn’t too sweet, but the chocolate and mint work together oh so well. The texture is lovely too and as promised it does have a fairly thick melt that is very silky on the palette. This is the perfect bar of chocolate for mint lovers, but its flavours are rather grown up. I like the rich tastes, and this is going to be a bar I pick up again and again. The Fry Family Vegan range is fantastic, and as long as we have an Ocado Smart Pass And they have these on special offer at 3for £6 then I’m going to keep working my way through them! This time we have something a bit different, schnitzels are pretty meaty and very European - so how did they manage? sometimes I do worry about feeding these things to my veggie partner - she’s very trusting! I always have a tomato with my sandwich and crisps at work, so this makes for a change! And no it’s not a spelling mistake. Believe me I stared at the packet for quite a while. 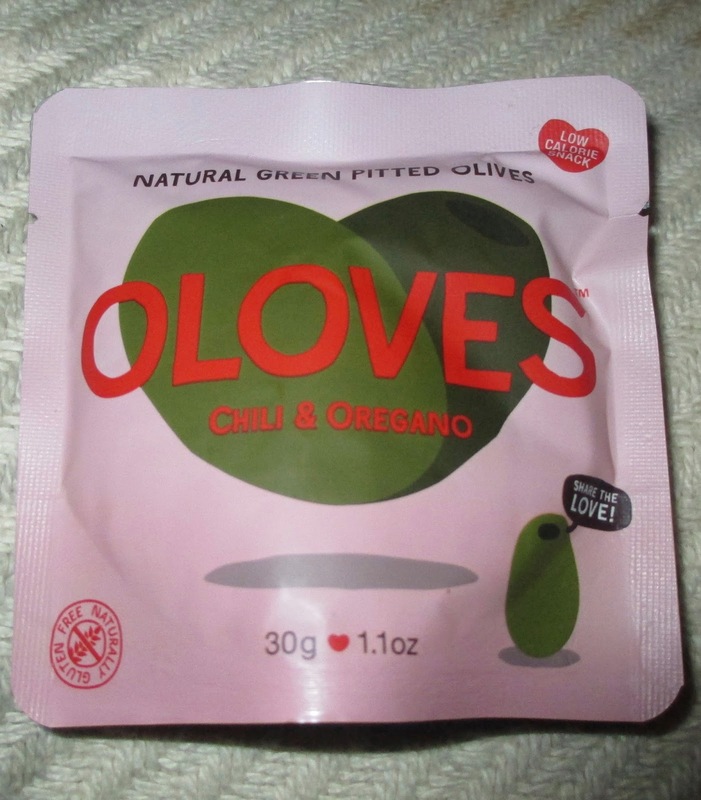 These “Oloves” natural green pitted olives are flavoured with chilli and oregano. Although it does sneakily mention garlic on the back of the packet, so people may regret sitting too close to me in meetings after lunch! They are naturally free of gluten and an all-round low calorie snack in a small packet that’s easy to fit into a lunchbox. 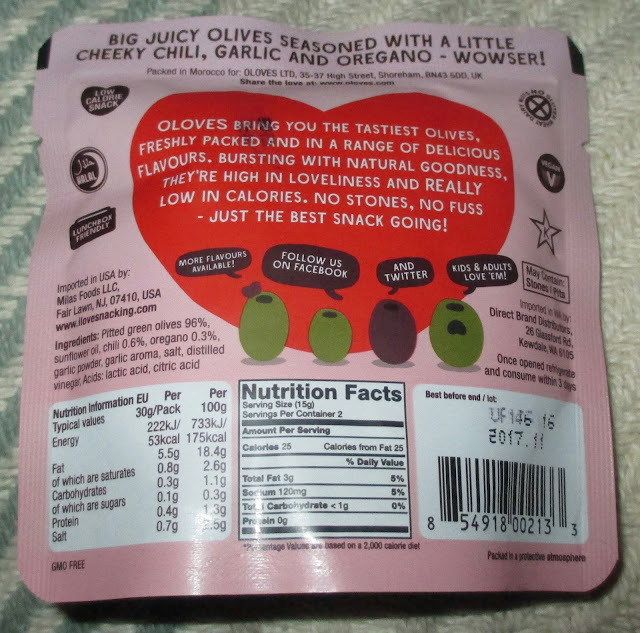 On opening there was quite a few green pitted olives filling the packet, which were covered in sunflower oil, and an oregano, garlic and chilli type flecked sauce. On taste there was the instant finely oiled green olive flavour mixed with the herby oregano taste followed by a subtle sweetness and the garlic. This mild garlic taste was quickly merged with a medium heat from the red flecks of chilli. The chilli left a pleasant medium tingle in my mouth during the aftertaste. These Oloves made for a very tasty alternative to my regular tomato. Also being ‘pitted’ means they’re not too messy with having to spit out stones in front of your colleagues in the canteen, however if you don’t want to get your fingers oily, I’d recommend a small spoon, fork or cocktail stick.. The 30g packet contains 53 calories, 18.4g of fat, 0.3g of sugar, and 2.5g of salt. Ingredients included; pitted green olives (96%), sunflower oil, chilli (0.6%), oregano (0.3%), garlic powder, garlic aroma, salt, distilled vinegar, lactic acid, and citric acid. A while ago we were contacted about trying some of the Yutaka brand Ramen at home kits. As this was something I'd been talking about with friends (the total lack of kits for ramen that were not just a cardboard bowl with cheap noodles) we jumped at the chance, picked them up from the parcel depot and then stashed them in the cupboard for a cold lunchtime to try them on. Now it's November, and we aren't out all the time those weekend lunchtimes are certainly here! The only difference in the kits is the paste you receive so we are only going to talk about one of them. Maybe if I pick up some Japanese greens to go on top (or tempura flakes like I always had at the Japan cultural centre in London 15 years ago). I decided on the Ton Kotsu - but as mentioned the noodles are the same in both. You also get two bundles per person which is generous, and the quality is great. And when you turn the paste into the sauce you can choose your own level of soupiness. I don't like it when it's mostly water and the noodles hide at the bottom, mainly because I struggle to eat it! The noodles were a fab quality, as you'd expect from Yutaka, and once you've boiled the kettle it essentially takes 5 mins to make. The paste is strong and tasty - very mouthwatering and has the same distinctive flavour that you'd get if you ordered this from a restaurant. Quality and easy to make - I look forwards to working my way through the other portions! I always enjoyed watching mythology films like Clash of the Titans, and Jason and the Argonauts when I was younger. I've watched them both recently and still get a kick out them. I do like the various plastiscine looking monsters such as the Hydra and Medusa. Whereas Medusa was a high priestess of Athena and had been turned into a gorgon and cursed with asps for hair and golden wings and skin after a particularly unfortunate encounter with Poseidon, the sea-god, and was made famous in Clash of the Titans. Poseidon came across rather helpful instead in a scene in Jason and the Argonauts. This Medusa ruby red ale from Harper's Brewery is sported on the label as having a mix of chocolate, roasted coffee and fruitless in its aroma, with a smoky coffee and toffee apple taste. On opening I'd certainly agree with the list of aromas, but with a dominance of dark chocolate. This leant to a weightier presence of chocolate malt in the brewing, which can bring out dark chocolate and roasted coffee flavours. On pouring this deep mahogany red almost brown ale, I must admit from its smell I was expecting a much darker colour, even though the label had described it as 'ruby red'. In taste there was the chocolate malt that gave a quick blast of dark chocolate only to be replaced by a smoky roasted coffee as the malted barley began to overtake my tastebuds. There was then a mild fruity bitterness from the hops followed by a sweetness akin to toffee from the crystal malt. This is certainly a very tasty beer and I'd agree with the lamb or beef roast dinner recommendation on the bottle, but don't forget there is always place for roast pork (… in my belly), especially with the sweet apple fruitiness within the ale. With its references to chocolate and coffee it could also be considered a pudding beer, and could either complement a chocolate fudge cake or a strong cheese board, but don't forget the chaser of port on the side! 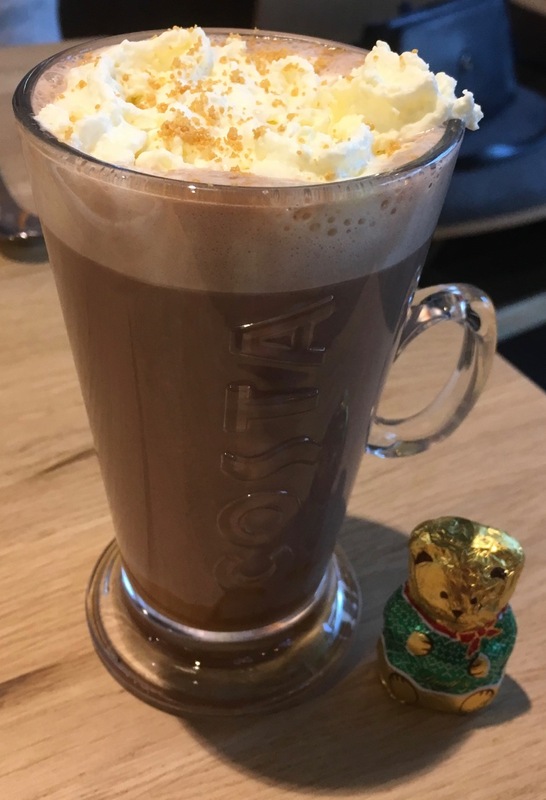 So yes, I ordered the Billionaire's Hot Chocolate in Costa and a small chocolate teddy bear to have as an extra treat. The drink arrived topped with cream and a light crumb. The hot chocolate was made with caramel syrup, which was very visible on the bottom and not mixed in. It looked like it was meant to be stirred, or you would risk an over-sweet last mouthful. The picture on the Costa website looks the same though, with the syrup being photographed as stuck to the bottom of the mug. I still stirred my drink, they did give me a spoon after all. I started with a taste of the biscuit crumb on the cream, and found it do be a very mild flavour. The cream was good though, and made the drink feel like a treat. The drink itself was pleasingly sweet and the caramel and chocolate made for a lovely rather indulgent flavour. I had this in the small option, and this felt right for such a rich drink. 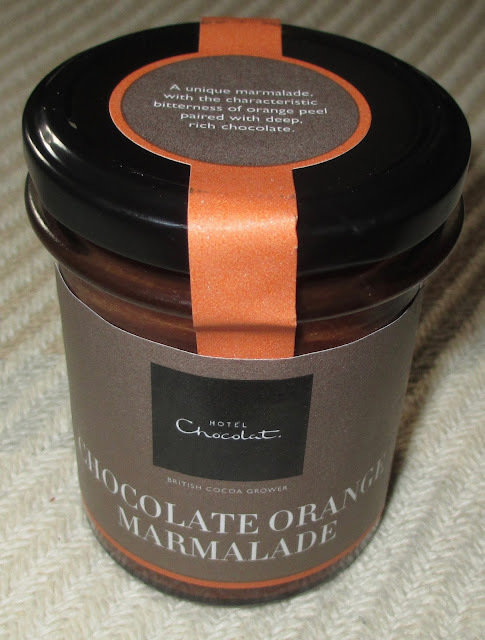 I liked it ever so much, it is essentially caramel and chocolate as its base flavours, so what is not to like. Next up I’m still going for the legendary Costa Black Forest Hot Chocolate, I’ll let you know how I get on. My favourite quick lunch is sushi. I discovered this at Uni and haven’t stopped the trend. Bromsgrove has a new Waitrose so I managed to pick up a selection to share for lunch. And here is one with quinoa instead of rice - super cool! Well - until you open it and find out that they put mushrooms inside without putting that on the main label on the box. Disappointment city. Luckily I was able to trade these with my partner for some of her lunch otherwise they’d have gone in the bin! The black rice rolls were nice, but didn’t overcome the disappointment of not getting to try the quinoa. My partners basic veggie selection. I also had a tiny box of Katsu bites which was a very welcome addition. The sauce is fantastic and basically a mayonnaise mix. Not healthy but very good. This felt worth the money for the box and went further than I expected. All in all it was a nice mini meal, but I’ll have to flip the boxes in future to check for things I can’t eat - get. I don't usually like ginger in tea. Mainly because the only ginger tea I have drank in the past is Lemon and Ginger, which has a habit of tasting a little medicinal, such as a cold remedy. Teapigs Rhubarb & Ginger should taste different at least. I do love rhubarb juice (sugared, of course) from the odd bit of rhubarb I grow in the garden (if I'm lucky). Though I was a little taken aback by the fifty / fifty ingredients in this recipe, as there is no tea involved just rhubarb and ginger. Obviously I've never written a blog about Lemon and Ginger tea, because I never bothered to look at the ingredients. I'll check next time I try to avoid a cup. 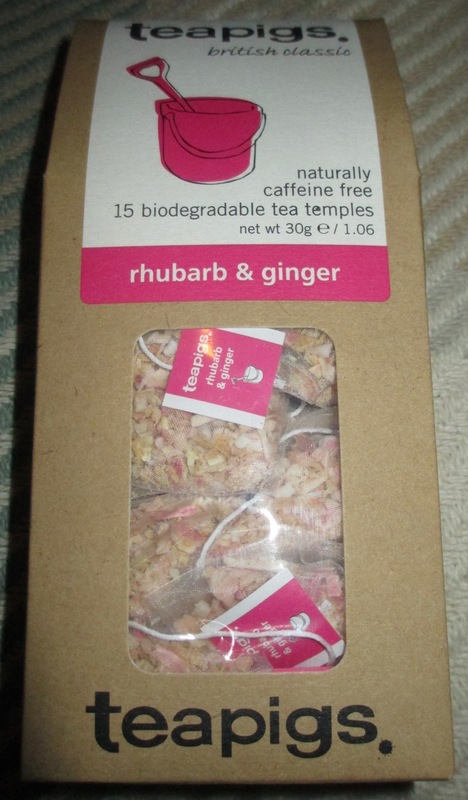 The flavour described on the back of the Teapigs Rhubarb & Ginger box is; "zesty rhubarb with a sweet ginger kick". There was certainly a dominant sharp fiery sweet smell of ginger on opening the packet within the box, with a fruity hint from the rhubarb. I rarely follow instructions, so ignored the recommended 3-5 minutes brewing time and left the tea temple in my mug for ages. There was a slight pinkish tint to the liquid in the mug upon removing the tea temple. On taste this was a surprisingly calming drink. There is an initial fruity zing from the rhubarb and sweetness with subtle fire behind it from the ginger. It was actually very nice indeed. Not a bit medicinal in flavour due to the fruitiness from the rhubarb and that sweetness from the ginger. The box also recommends trying a tea temple in iced water, which could be refreshing in the summer months! The 30g box contains 15 biodegradable tea temples. Ingredients are naturally caffeine free and include 50% rhubarb and 50% ginger.